Understanding behavioral finance and the effects of human behavior on financial markets provides insight into the human side of financial decision making. This insight can help investors take a more rational and less emotional view and remain committed to long-term strategies and goals during periods of market volatility. Both investors and advisors often make incorrect judgments based on personal beliefs, past experiences, personal preferences, and emotions. 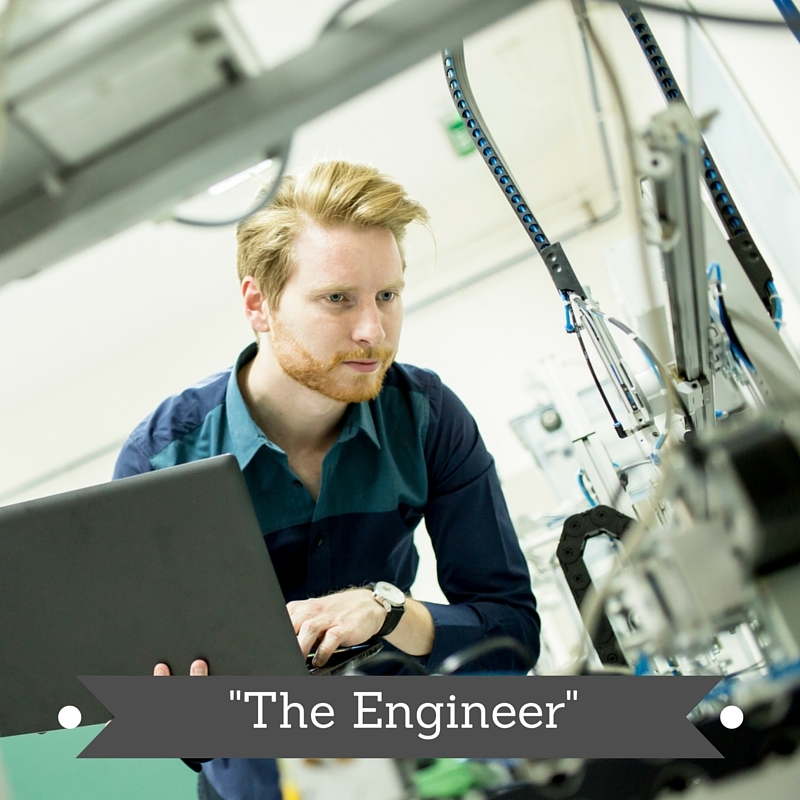 These biases direct them away from rational, long-term thinking. Further, biases focus the investor or financial advisor on only one aspect of what could be a complex financial decision-making process. A common interpretation in behavioral finance is that rationality is the result of a pure cognitive process which can be behaviorally biased. In general, the bias has a negative connotation because it produces a distortion in the calculation of an outcome. When a decision-making process is cognitively biased the outcome leads to sub-optimal results or judgment errors. Roughly speaking, the subject might make irrational choices due to faulty reasoning, statistical errors, lack of information, memory errors, and the like. Differently, when the decision is emotionally biased, it means that the cognitive process has been influenced by feelings, affects, moods, and so on (let’s label these states “emotions”). This leads us to irrational decisions or actions. Biases are influential underpinnings in terms of the decisions we make. Such behavioral biases cannot be completely eliminated, but recognizing them is the first step in managing them, reducing their effects and avoiding self-destructive behavior. 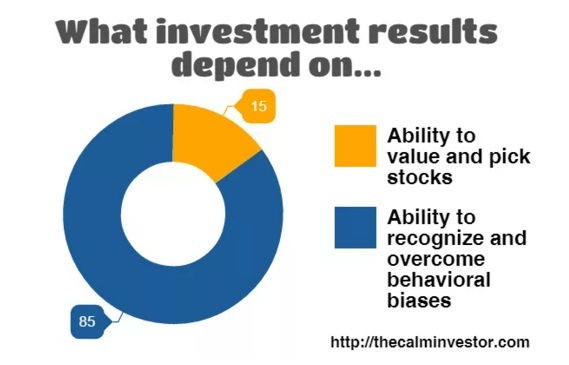 In increasing numbers financial advisors are adopting the behavioral components of investing. They may have worked with their investors for long periods of time, focusing predominantly on risk tolerance and objectives. Not so now. Advisors are making the effort to understand why investors often react in the moment and revert to short-sighted beliefs that may hurt their returns. Many advisors are implementing behavioral insight processes that deliver greater self-awareness for recognizing potential advisor AND investor behavioral tendencies. 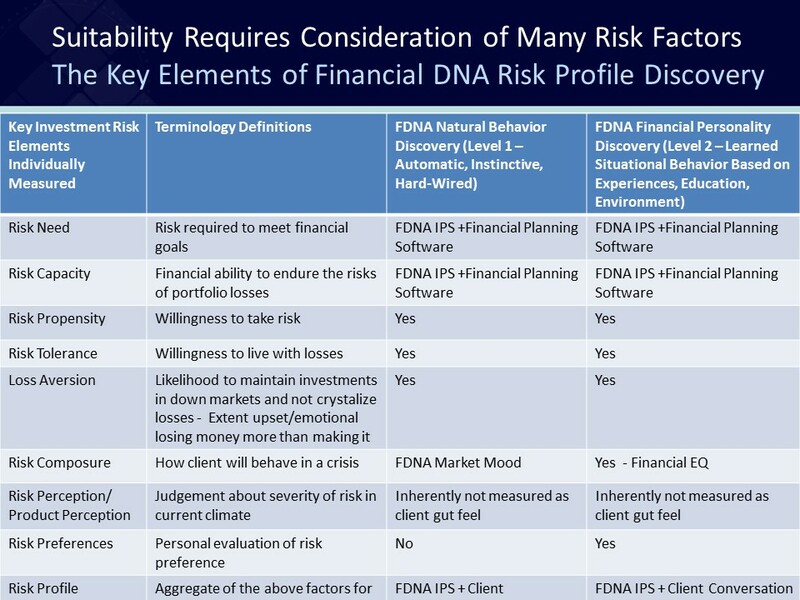 Tools such as ones provided by Financial DNA measure each of these behavioral biases independently and display them on a Behavioral Management Guide. This enables financial advisors to discuss the strongest biases with the client and develop a strategy for managing them. Managing money is too important to be driven by our emotions. Running to our inherent go to’ behavior when markets fluctuate has to be managed. The responsible first step in any investor/advisory relationship, therefore, is to objectively uncover the financial personalities of both advisor AND investor, using a measurably reliable, independently validated discovery process. Anything less degrades the advisor’s fiduciary responsibility and investor experience while opening the door for compliancy issues and loss of clients. Advisors and their staff love to stereotype their clients. Without even realizing it, most firms segment their clients based on communication style using a crude method of stereotyping. While this segmentation is informal, it 100% aligns to the four fundamental client communication styles. Below is a guide to the four most common client communication styles and how to serve them based on their common stereotypes. Any seasoned advisor will agree that these tips can save your client relationship. Make the meeting have structure, provide an agenda ahead of time. Provide research to back up recommendations. Give them space to review the research and contemplate options. Ask leading questions to draw them out beyond simple yes/no options. Follow-up the meeting with additional resources to educate themselves and a to-do list as “homework”. 2. 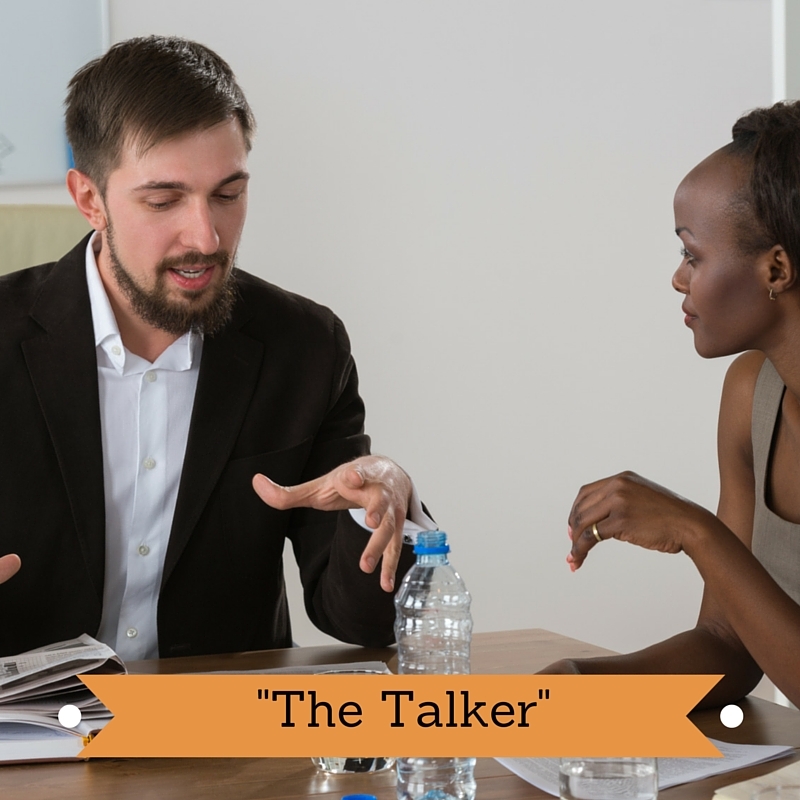 The Talker: The “talker” can be a potentially great referral source, but they sure can do a number on your calendar! Make the meeting fun and inspiring. Swap stories of influential people that share a similar situation. Follow-up the meeting with a phone call, even invite them to a social event. Everyone likes the life of the party, or at least wants to hear what they’ll say next. 3. Mr. or Ms. Guarantee: Averse to risk, Mr. or Ms. Guarantee cant stand the thought of losses and immediately jump to the worst case scenario. They wont like the idea of complete uncertainty and will often ask for written guarantees and whole-heartedly compare their performance to benchmarks. They need continuous reminders to stick to their plan and that slight ups and downs are normal. Make the meeting relaxed. Use a coffee table or living room type setting. Reference past experiences and make recommendations accordingly. Follow-up the meeting with a phone call AND email about next steps. 4. 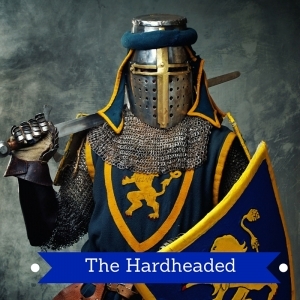 The Hardheaded: “Do as I do, not as I say”. The hardheaded have a view of the world that every rule is intended to be broken. These clients are the best selective listeners in the world and will interject on a dime to keep the discussion focused on their self-centered plans goals. Make the meeting formal and focus on how you will meet THEIR goals for returns. Be prepared with a sample big picture plan. Afterward, follow-up with an email or text summarizing the discussion. Following these guidelines will keep most client experiences on the right path to success. But if you ever find you can’t quite find the right fit, either try a mix of the options above, or there are tools and training available to support your needs. People have unique financial needs; no two situations are ever exactly the same. Finding a financial advisor who really understands us and can deliver advice tailored to the specific situation can make a significant difference in helping us accomplish our life and financial goals. It takes a special kind of person to be able to unlock deeply held information at the first meeting. 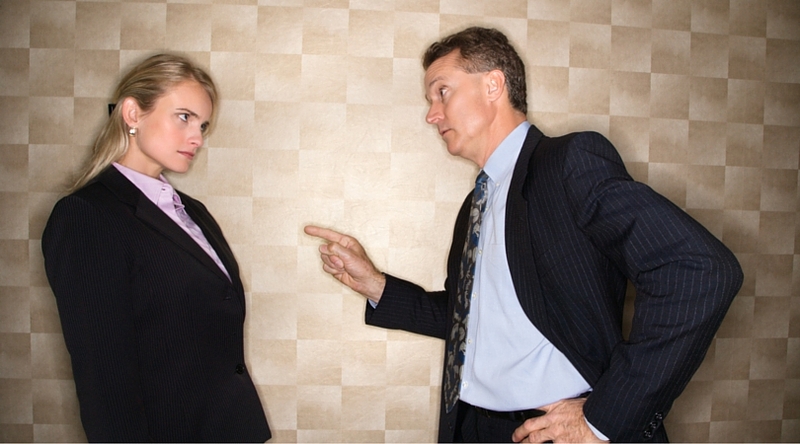 It gets progressively more difficult if that first meeting is not conducive to our communication style. Fortunately, some advisors have Behavioral Finance tools available to ensure they are meeting your needs. So many of us settle for second best when it comes to engaging a Financial Advisor. Yet how much more could be achieved, if the Financial Advisor we chose not only fully understood investments, but also knew how to uncover your goals and behavioral biases that may be a blockage to achieving those goals? I wonder why we prolong a relationship with our Financial Advisor when it’s clear we are settling for second best. I want someone smart, trustworthy, and dependable and who cares about my future and my financial wellbeing by making sure they really understand me and are not giving me a generic portfolio that they prefer. Joanna Cleaver writing for US Money puts it like this. You stay because breaking up is hard to do. I want my Financial Advisor to see their self as a financial soul mate. I want them to understand I have a bias for Newness – giving more weight to something new and exciting, rather than because it made logical sense to do otherwise. I want them to partner with me as I manage my Mental Accounting bias – needing to allocate my finances into specific buckets for explicit purposes, rather than for long term goals. Maybe this sounds radical, but why can’t I have a Financial Advisor who understands my communication style? I need time to understand and dwell on what they are saying. I need information delivered to me in a relaxed environment. Wouldn’t this achieve a greater likelihood that I would remain with the same Financial Advisor for years? Many years ago, I wanted to invest in an exciting start up. Something about this entrepreneur and his ideas excited me. My financial advisor wouldn’t even discuss the opportunity referring to me as a ‘novice’ in terms of investing and to the entrepreneur as a ’7-day wonder’. The advisor had no idea about me, my plans for my life and indeed I think saw me as an amateur. As I am reminded of that incident many years ago, I wonder if the advisor (long since out of my life) remembers the conversation as he watches the multi-billion dollar empire this young man went on to build. All it would have taken for this story to have been different was an advisor who understood that I don’t take risks, but that I am very savvy when I see an opportunity, and that at that time I could well afford the amount I wished to invest. Its time for Financial Advisors to approach us as our financial advisory soulmate. They need to take time to match us with advisors based upon communication style and understanding our behavioral biases. With a validated behavioral and communication process, I believe I can find my financial advisor soulmate. It isn’t just a need, but I believe it is their responsibility to ensure my financial and life goals are met. According to a recent survey (McAdam LLC and Harris Poll 2015) of more than 2000 Americans, 71% said some aspect of meeting with a financial advisor scared them. The most common reasons cited were costs, trust and the inability of an advisor to help them with their financial situation. However, a majority of CFP professionals feel having the CFP designation increases the trust and confidence levels for clients, according to a survey by the CFP Board of Standards Inc. and Aite Group. What accounts for the disconnect? The Financial Services industry has traditionally lead with a left-brain approach: research, analytical and factual. But at least 50% of your clients lead with a right-brain approach that is based on feelings and relationships. With the current market volatility, the fact that you have educated your pre-retirees on withdrawals in a declining stock market means very little when facing hard choices about retiring triggers your clients emotions. They are scared about having to work longer, potentially cutback the “dream lifestyle” or just having to live with the uncertainty of it all. But is trust a “skill” you can sharpen? While I believe each person has a certain inherent trustability, there are ways you can get beneath the surface of a client to get past their fear factor. 1. Let the client choose how to proceed. 2. Stay present and open to not knowing exactly what turn the client might take in your meeting. Be curious as to the “threads” your client may be unraveling. In your enthusiasm to talk about the carefully crafted portfolio you have designed and the safe withdrawal strategies, your client may be wondering, “What impact will all these uncertainties have on my lifestyle?” It would be best to acknowledge that fear and go down that path to demonstrate a deeper level of awareness. 3. Listen for and carefully observe energy or tone shifts. This type of intuition is not always an advisor’s strong suit. Your client will give you cues: voice level, eye contact, and pauses. But when you listen to the “what” (fixed income in retirement) and are able to move to the “who” (no longer having income from a job, uncertainty of what’s next), you will build trust as you get at the client’s real fears and help them discover their next best action steps. Focus on the one skill that will have the greatest impact on your relationships with both prospects and clients: TRUST. 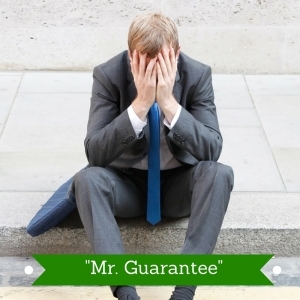 And, in return, your clients will face these uncertainties with greater confidence.